We are delighted to offer this new game of Dragon Ball Budokai Tenkaichi 3, in which you can recover the magic balls and make the wish to survive Goku's friends for enemies to attack, no longer among us. Choose the most desired series and get to fight a tough battle where martial arts Saiyan be happy to fight you character. You can also play in two player mode so your friend or brother help you win the battle or if you prefer to fight the second player in a fight duels. Take advantage of your energy to devastating kame hame has knocked that will leave your opponents. 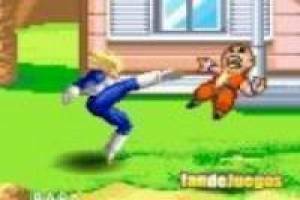 Enjoy the game Dragon ball budokai tenkaichi 3, it's free, it's one of our goku games we've selected.